Neil Schwartz was born and raised in Los Angeles, California. He has been a California trial attorney since 1977. Neil served as trustee of the Los Angeles County Law Library and as an arbitrator for the American Arbitration Association in addition to the Los Angeles County Superior Court. He also served on the Board of Directors for Abraham Joshua Heschel Day School for twelve years. Neil has been selected by Los Angeles Magazine as one of the “Super Lawyers” of Los Angeles for the years 2008-2013. He is also a lifelong spiritual seeker and avid baseball fan. What if Tomorrow Never Comes? by Neil David Schwartz is a highly emotional book which tells the story of how your life can change when faced with not one, but two painful losses. This is the story of Neil Schwartz and his passage from unbelievable tragedy to acceptance and recovery. When his wife suddenly passes away, Neil is faced with having to care for his young dying daughter while dealing with the loss of the woman he loved. This book talks openly about the battle with cancer, the journey of a grieving father, and the stories of the people who have influenced his recovery. Neil Schwartz, with the help of his sincere and emotional writing style, makes What if Tomorrow Never Comes? a powerful read for anyone, and even if you end up reading the book with tears in your eyes you would have learned a valuable lesson about life and the things that we should really cherish and hold dear. The death of his wife, Joanne, and the cruel illness of his young daughter, Amy, cast a light of despair and sorrow on Neil’s personality and contributed to his development as a person. It’s painful to see how sometimes these types of events awaken us, how sometimes our broken heart serves as a key to understanding how life works and what really matters. I imagine it is unspeakably hard to lose your wife and child and most people find it extremely hard, if not impossible, to recover from such a loss. 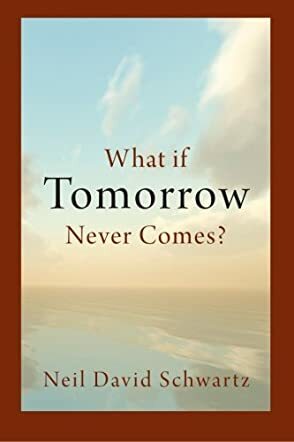 I recommend What if Tomorrow Never Comes? to everyone who has ever lost a loved one, to everyone who lives with the fear that life might suddenly change forever and, most of all, to everyone with the ability to understand such a story and put themselves in the author’s shoes, if only for a second. Don’t see it just as a true story well written; see it as an opportunity to look into someone else’s soul and to start searching yours for the true values in your life.